The overall goal of the University of Siegen is to contribute to a humane future and to take responsibility for people and society. This is reflected in the guiding principle of the University of Siegen: creating a common future. It is in the self-concept of the University of Siegen to link regional responsibility for education, training and societal issues with the internationally customary claims on teaching, study, research and transfer of knowledge, and to pursue their evolution as a permanent task. as well as the principle of participation and co-responsibility. Here you will find the university development plan of the University of Siegen. 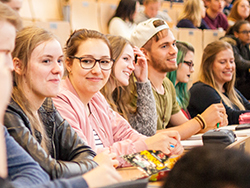 The University of Siegen has gained in attractiveness in the past few years – as the significant increase in student numbers proves. From architecture to business engineering, the university offers a versatile, high-quality progra. Across all study programs, opportunities exist to choose both, individual interests, as well as interdisciplinary study components. Students will get individual and competent support and counseling – starting with the course selection, to the study organization, up to successful completion. You have ample opportunity at the University of Siegen to actively participate and to try what you learned in practice. The University of Siegen has interesting research areas, which are taught in corresponding degree programs. The offer is also characterized by numerous extraordinary study programs, which in their combination form a unique feature, nationwide. One example is the study program "Real World Economics", which also imparts knowledge in areas such as communication, ethics or organizational development. The various study programs in the field of media sciences are very popular. 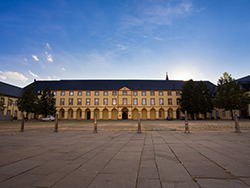 A large number of students choose the University of Siegen as a place of study in order to profit from the broad and well-founded range of courses offered. A further profile area is the outstanding teacher training with focus on special education. The Center for Teacher Training and Educational Research (ZLB) coordinates and organizes, as a central scientific institution of the university, the interdisciplinary teacher education courses across the different schools. With its course "German and European Economic Law", the university has successfully introduced another innovative approach. The study combines business administration with economic law and thus represents an alternative to classical study programs. The University of Siegen also offers a series of English-language courses as an internationally oriented university.. Excellent cultural and media research has been a tradition at the University of Siegen for many years and is recognized nationally and internationally. Since the beginning of 2016, research is done in a number of subprojects of the DFG special research area "Media of Cooperation", on how digital developments determine our everyday life and what social consequences arise from it. Within the framework of the graduate program "Locating Media / Situierte Medien", young scientists receive high level training. 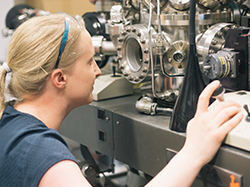 Another outstanding research focus of the University of Siegen lies in the area of sensor technology and nanosciences. For many years scientists have been researching and developing multi-sensor systems and their application, especially in the field of chemical and biochemical sensors. Through the interdisciplinary cooperation of different working groups, the individual sub-areas range from the chip level, to various algorithmic and software solutions, all the way up to systemic solutions. The research study group "Imaging New Modalities" is working in the area of imaging sensory research. Here, the central area of application is civil security. For some years now, SME research has developed into a further focus at the University of Siegen. In interdisciplinary cooperation of economic sciences with business information systems, law, and economic education, current developments and problems of a digitized and globalized economic world are examined, and their impact on medium-sized enterprises is studied. The topic of "Inclusion" is being explored from various angles at the University of Siegen: Inclusion on cultural education, inclusion by means of funding education, and inclusion as a (social) spatial strategy, for example in urban development. The research, which includes the scientific as well as the artistic work, is gathered under the interdisciplinary working title "Building Spaces". In the research college "Shaping the Future ", very specifically takes up the university's guiding principle. Scientists work on interdisciplinary questions of future ability and future development, across several schools. The internationally widely networked research college has also proven to be extremely attractive for renowned guest scientists.